In the Hindu pantheon, goddesses represent strengths, beauty, compassion, good fortune and creativity. While the female figures elicit great respect from worshipers, their earthly counterparts sadly do not receive the same degree of respect. In India, gender is a major determinate for mobility, social status and personal safety. According to Save the Children India, over 68 percent of women who live in the country are subject to domestic violence. To draw attention to their plight, the organization created a media campaign called “Save Our Sisters”. The anti-trafficking series of images aims to shed light on the exploitation that many young women and girls face. 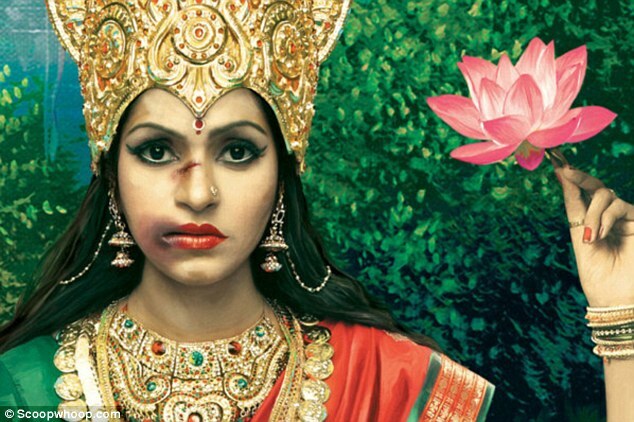 Pictures of traditional goddess representations are altered to show the figures as subject to abuse, reminding society that no one is safe from aggression and discrimination. The pictures are intended to resemble old oil paintings in the tradition of hand-crafted devotional illustrations. Models were photographed and digitally manipulated to create the striking images. The normally serene, dignified expressions of the goddesses are replaced by tears and wounds, connecting the actions of human beings to the divine. Far from just a problem in India, the ads allow the global community to take note and consider their own relationships with trafficking and violence against women.